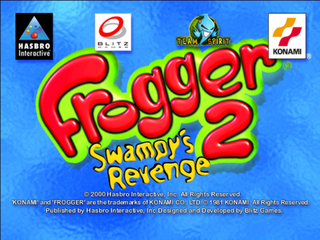 Frogger 2: Swampy's Revenge is an entry in the Frogger series, and was released among other consoles for the Sega Dreamcast in 2000. The Dreamcast version was released exclusively in North America. Like the original game, Frogger is still tasked with saving other frogs (his children, in this game) but the stages are rendered in full 3D and Frogger now has the ability to perform different jump techniques. This game is more action based than the 1997 remake. Despite its name, Frogger 2: Swampy's Revenge is not a direct sequel to the original Frogger (this was called Frogger II: ThreeeDeep! and was released in the mid-1980s), but instead a sequel to the 1997 3D update of Frogger (sometimes known as Frogger 3D), released for Windows PCs and the Sony PlayStation also by Hasbro Interactive. Main article: Frogger 2: Swampy's Revenge/Magazine articles.